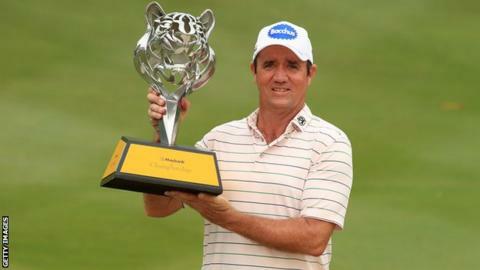 A thunderstorm delayed play by 100 minutes with the leaders on the 18th green at the Maybank Championship in Malaysia - before Scott Hend beat Nacho Elvira in a play-off. Elvira's backswing was disrupted by a thunder clap as he pitched to the last, and his shot came up 30 feet short. "It was thunder in a bad moment but the gods did give me one back with that putt," said 32-year-old Elvira, who was the overnight leader going into the final round. "Obviously I had a bit of luck on the play-off hole," said Hend. "If you don't have any luck you won't win. I had the luck today, unfortunately for Nacho. His time will come. He's going to win. He's a great player." Oliver Fisher finished as the best placed Briton, with the 30-year-old Englishman's 69 enough for a tie for fifth on 11 under.